The COPPOC One Health Lecture was established in 2014 to provide an annual campus-wide lectureship that focuses on the symbiotic relationship between veterinary and human medicine and its world-wide impact. Coppoc One Health Lecture-"Antimicrobial Stewardship and One Health"
The fifth annual Coppoc One Health Lecture will be held November 1 in Lynn 1136, and will feature a talk entitled, "Antimicrobial Stewardship and One Health." Dr. Jeff Bender, a Professor in the School of Public Health and an adjunct professor in the College of Veterinary Medicine at the University of Minnesota, is the featured speaker. He is currently the Director for the USAID funded One Health Workforce Project, a workforce development program focused on preventing, detecting, and responding to emerging pandemic threats. In addition, he is a Co-Director for the NIOSH funded Upper Midwest Agriculture Safety and Health Center (UMASH), a Center focused on improving the health of agriculture workers and their families. His primary teaching and research interests include infection prevention, disease surveillance, emerging zoonotic diseases, occupational safety, food safety and antimicrobial resistance. The fourth annual Coppoc One Health Lecture, was held November 2 in Lynn 1136, will feature a talk entitled, "School Food Defense Framework: One Medicine Concepts in Action." Purdue Veterinary Medicine alumna Regina Tan (PU DVM '99), director of the USDA Office of Food Safety in the Food and Nutrition Service, is the featured speaker. Dr. Tan has led or served on numerous public health advisory committees, interagency teams, and working groups pertaining to threats to public health. She earned her DVM degree and Master of Science in public health molecular epidemiology from Purdue in 1999 and 2000, respectively. 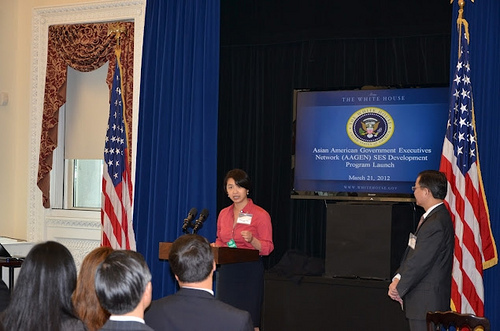 A Diplomate of the American College of Veterinary Preventive Medicine, Dr. Tan began her career with the federal government in 2000 as a Commissioned Corps Officer in the U.S. Public Health Service, where she was assigned to the CDC, first as an epidemic intelligence service officer and then as a preventive medicine fellow. In 2003, she joined the Food Safety and Inspection Service (FSIS), where she served for two years as a veterinary epidemiologist, managing the Consumer Monitoring System team and hurricane response components. Dr. Tan rejoined the CDC in 2005 and served as a liaison with the Public Health Service's Armed Forces Medical Intelligence Center before taking a position in the private sector with the MITRE Corporation. She returned to the FSIS in 2010. Dr. Tan's presentation will identify gaps among existing food defense resources in the United States School Food Distribution system and identify symbiotic collaborations among agencies at the federal, state, and local levels necessary to fill those gaps. The Coppoc One Health Lecture was established to provide an annual campus-wide event that focuses on the symbiotic relationship between veterinary and human medicine and its worldwide impact. The lecture is named in honor of Dr. Gordon Coppoc, Purdue professor emeritus of veterinary pharmacology, and his wife, Harriet. Dr. Coppoc is the former head of Purdue Veterinary Medicine's Department of Basic Medical Sciences and served as director of the Indiana University School of Medicine-Lafayette and associate dean of the Indiana University School of Medicine before retiring in 2014. The third annual Coppoc One Health Lecture brought an Emory University scholar to Lynn Hall to address the topic of resistance to antibiotics and other antimicrobial agents Wednesday, November 2. James M. Hughes, MD, professor of medicine and public health at Emory University, talked about the magnitude of the problem domestically and globally, and opportunities going forward. Dr. Hughes holds joint appointments in the School of Medicine (infectious diseases) and the Rollins School of Public Health (global health) at Emory University and is co-director of the Emory Antibiotic Resistance Center. Prior to joining Emory in 2005, Dr. Hughes worked at the Centers for Disease Control and Prevention (CDC), serving as director of the National Center for Infectious Diseases, and as a rear admiral and an assistant surgeon general in the U.S. Public Health Service. During his talk, entitled “Addressing Antimicrobial Resistance: Importance of a One Health Approach," Dr. Hughes reviewed historical facts, including the crude death rate for infectious diseases, which declined from a high rate during the first influenza pandemic in the U.S. in about 1919 and fell further in the early 1940s with the first use of penicillin. The rate continued to drop until a slight rise began in 1980, as AIDS was recognized, and pneumonia and blood stream infections surfaced as syndromes where drug resistance is particularly important. The second annual Coppoc One Health Lecture gave faculty, staff, students and other guests a chance to hear from Duke University Professor Gregory Gray, who spoke about novel influenza viruses, which can cause disease outbreaks in both animals and humans. The lecture, held in Lynn Hall Wednesday afternoon at 4:30 p.m., drew a crowd of about 60. Speaking on the topic "Modern Livestock Production and Novel Influenza Virus Generation: Are the Benefits Worth the Risk? ", Dr. Gray stressed the importance of taking a "one-health" approach in addressing emerging infectious diseases. At Duke, Dr. Gray has affiliations with the Division of Infectious Diseases in the School of Medicine, Duke Global Health Institute and Duke Nicholas School of the Environment. His research involves identifying risk factors for occupational diseases, particularly infectious diseases. Noting that veterinary professionals are not being thought of as players in planning for dealing with pandemic influenza, Dr. Gray said it will take young people reaching across fences between disciplines, to effect change in the way these "wicked" disease problems are addressed. He encouraged veterinary students to not be afraid to propose ideas. "Do whatever you can to move things forward," he said. The lecture was followed by a reception in the Continuum Café. 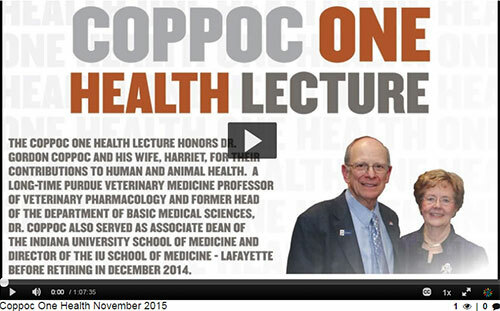 The Coppoc One Health Lecture honors Dr. Gordon Coppoc, Purdue professor emeritus of veterinary pharmacology, and his wife, Harriet. A longtime Purdue Veterinary Medicine faculty member and former head of the Department of Basic Medical Sciences, Dr. Coppoc also served as director of the Indiana University School of Medicine-Lafayette and associate dean of the Indiana University School of Medicine before retiring in December 2014. A researcher from the National Human Genome Research Institute gave the inaugural Coppoc One Health Lecture last Thursday, November 13 in Lynn Hall. About 70 people came to hear Dr. Elaine Ostrander, a National Institutes of Health distinguished investigator and chief of the Cancer Genetics Branch, who talked about the contributions of research toward human and animal health and well-being. Her studies focus on genetic mapping as it relates to cancer in humans and their canine companions. The lecture is named in honor of Purdue Professor of Veterinary Pharmacology Gordon Coppoc, and his wife, Harriet. A longtime faculty member and former head of the College of Veterinary Medicine's Department of Basic Medical Sciences, Dr. Coppoc is director of the Indiana University School of Medicine-Lafayette and associate dean of the Indiana University School of Medicine. The lecture began with opening remarks by Dr. Coppoc, who is retiring at the end of the year. Dr. Coppoc earned his DVM degree at Kansas State University and his PhD at Harvard, and joined the Purdue faculty in 1971. Recalling his early years at Purdue, he remembered that when he was asked how he could teach both veterinary and human pharmacology, he replied, "There's one medicine with different patient populations." PVM Associate Dean for Research Harm HogenEsch opened the program by thanking Gordon and Harriet for their generosity in establishing an endowment to support the lecture series. The lecture in Lynn 1136 was preceded by a reception in the adjoining hallway. Guests included several IU School of Medicine students as well as PVM faculty, staff and students, and community residents. At the conclusion of the event, attendees autographed the promotional signs for Dr. Coppoc.